The Cliffsofmoher had to be put down. THE owner of The Cliffsofmoher, the horse that died at the Melbourne Cup on Tuesday, has revealed how heartbroken he is over the tragic event. The five-year-old had to be put down after fracturing a shoulder early in the race, sparking outrage among critics of the racing industry. 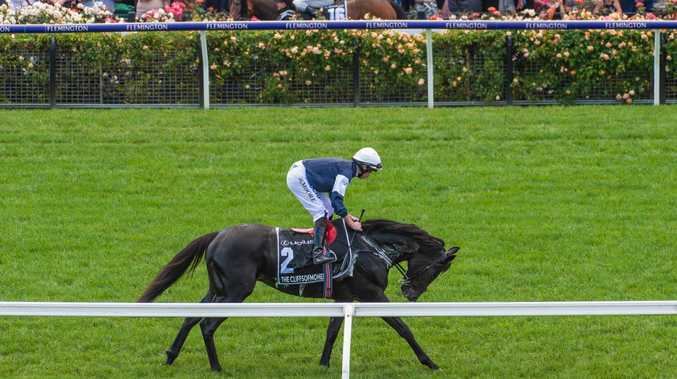 Owner Nick Williams opened up on the devastating impact of his horse's death on everyone involved with The Cliffsofmoher, telling broadcaster Gerard Whateley it ruined the entire Melbourne Cup for him and the team. "It destroys it for us," Williams said on SEN radio today. "The lads that look after the horses and live with them 24/7, they're absolutely devastated, and I'd have to say no more devastated than us. "It's unfortunate when one of these catastrophic events take place. I really don't know what to say." Williams said he cares deeply about all of his horses and does everything possible to look after them. He also revealed when he saw the worst happen to Cliffsofmoher, he desperately hoped he didn't fall and take out other horses or jockeys. "Horse welfare is everything and we pride ourselves on really looking after our horses and to see that happen is absolutely devastating," Williams said. "My first thought was please don't fall and take out others and put human life at risk as well. "In those events, they can turn into something much worse. Fortunately (jockey) Ryan Moore did a wonderful job and managed to pull the horse up safely and make sure the horse suffered a minimum of pain." Despite some raising concerns about The Cliffsofmoher's condition before the race, when some commentators noticed the UK raider sweating before lining up at the barriers, Williams was adamant there was nothing wrong with his health before the race. "That horse was sound as a bell, there's no doubt about that," he said. "You think what could we have done, but I keep coming back to the fact that there's absolutely nothing we could have done because the horse as in absolutely perfect order when he got onto the truck going to the races." Screens were erected as The Cliffsofmoher was put down. Veteran Channel 7 commentator Bruce McAvaney described what happened to The Cliffsofmoher as a "tragedy" and trainer Aidan O'Brien reflected on it later on Tuesday. "Unfortunately these things can happen to a horse galloping around the field at home," O'Brien said. "It's very sad. It could have been worse, Ryan (Moore) could have taken a fall off him, someone could have been seriously injured." The death sparked a savage backlash by animal rights groups. People for the Ethical Treatment of Animals (PETA) called for an investigation into the death, which it described as "the most recent victim of the cruel annual spectacle". 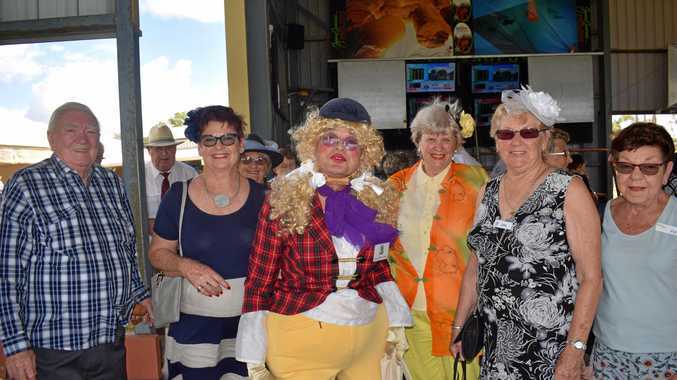 "The Melbourne Cup is the (disg)race that stops a nation. 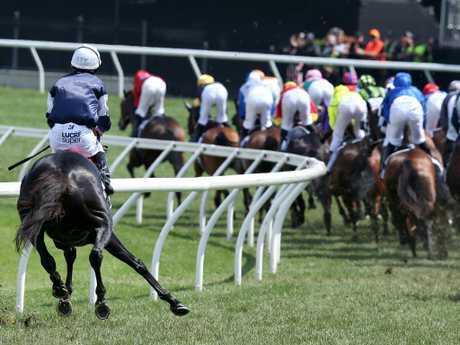 It's heartbreaking to see another horse needlessly lose its life during the Melbourne Cup," senior campaign manager Ben Pearson said in a statement. The RSPCA released a statement on the matter, joining the chorus of discontent. "RSPCA Australia has long voiced its concerns about the welfare of racehorses, including the use of inhumane devices such as whips and tongue ties, as well as the risk to injury and death during races," RSPCA Australia spokesperson Jane Speechley said. 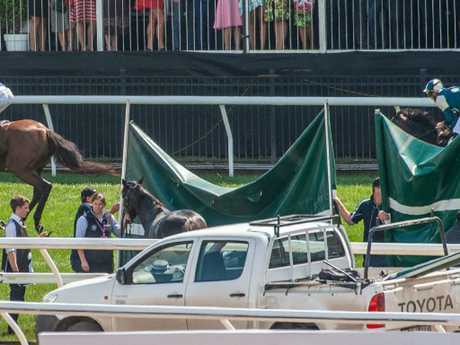 "Today's tragedy is a stark reminder of the risks these horses face every time they run, and highlights that behind the gloss and glamour of Cup celebrations there is a dark reality. "The racing industry has much work to do across industry standards and enforceable regulations, to meet community expectations and care for the welfare of the animals involved." The Cliffsofmoher fell behind the field after fracturing his shoulder. It is the fourth time in the past six years that the Cup has been shrouded by the death of horses. French-trained horse Verema had to be put down after an injury suffered in the 2013 Cup. A year later pre-race favourite Admire Ratki died after collapsing from heart failure in the stalls minutes after the race. Araldo placed seventh but was spooked by a flag in the crowd on the way back to weigh in, kicking out and breaking a rear leg on a fence. In 2015 crowd favourite and three-time Cup runner up Red Cadeaux had to be euthanised two-and-a-half weeks after the Cup as a result of complications from an injury suffered in that year's race.